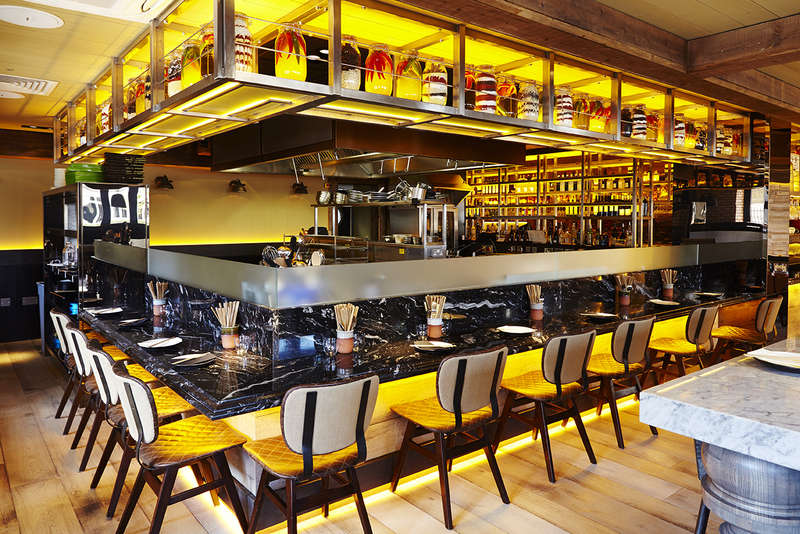 MOMMI Japanese-Latin Raw Bar and Grill has arrived in Clapham. Mister Important designed the urban modern luxe interior, decorated with photography by Ben Watts (brother of actress Naomi Watts) and a bespoke mural by Melbourne-based street artist RONE. My eyes were drawn to the low marble-topped bar surrounding all the action of the theatre kitchen. We pulled out a stool and perked our bottoms. The kitchen is run by Paul Sowden who has designed a menu influenced by both Japanese and Latin cuisine which, when combined, emanates a Miami vibe. The menu is bursting with a mix of fresh raw seafood, vibrant salads and Robata-grilled meats. Most dishes are healthy small plates designed to order in bulk and share. I played roulette with a bowl of Padron Peppers with Sea Salt. “They aren’t spicy at all” my friend boasted, chomping down on another pepper. I smirked, perhaps a little sadistically, when he reached for the water to cool down. The dish was great, and really fun! From the Robata Grill, we sampled smoky scallop and pancetta skewers, served with smashed peas, choclo and huacatay sauce. I popped the entire skewer into my mouth. As my molars did their job, the juicy scallops burst with sweet juice. Obviously I grabbed another, and another. To round up our experience, we delved into Tuna Tataki from the Raw Bar. The Raw Bar boasts an array of naturally nutritious offerings but my friend and I love tuna. The fresh fish was flamed seared Japanese-style, flavoured with coriander, onion ponzu and truffle oil. We agreed it was a great final dish. I spent the evening with my mouth glued to a glass of Fuji Rocks. A perfect cocktail of Yamazaki whiskey, crème de cacao, blood orange, bitters and garnished with a dark red cherry. BUT, without a doubt, MOMMI is the place for Pisco. With its own Pisco section of the menu: plum & blood orange; green tea & chamomile; guava & pineapple, and an extra special Bloody Pisco for weekend brunchers. Sip your way through the cocktail menu to discover your new favourite drink. Although the ingredients are simple, and often raw, the dishes are clever and complex. MOMMI has created a innovative restaurant beyond the familiar. It so inviting, guests will want stay and party into the early hours soaking up the Latin flavour. Bravo.